Sorry it’s been ages since I posted, it’s been one of THOSE months. 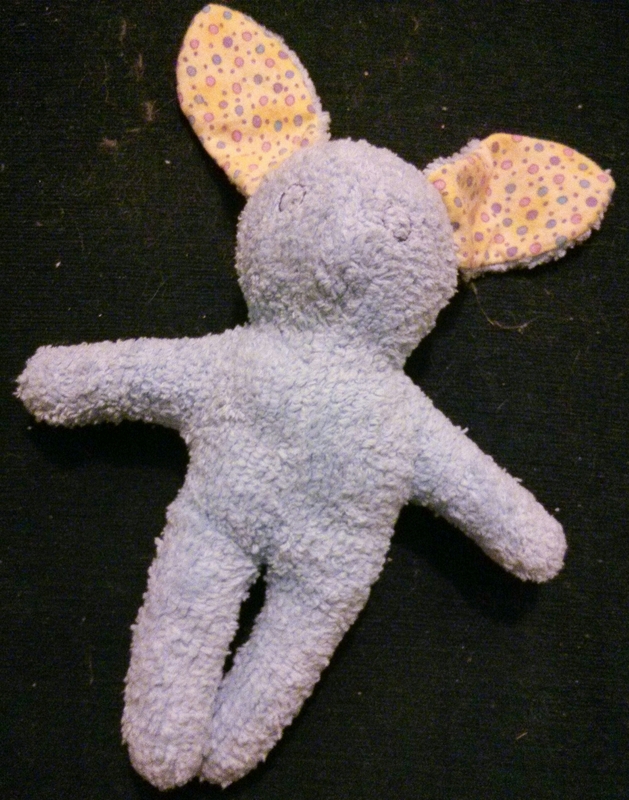 In other news, I hand sewed this bunny for a future human. He’s nice and soft and cuddly and baby proof. I’m always wary of what to give babies, and don’t even trust safety eyes, that’s why his eyes are just embroidered circles. I may go over them and add a mouth, but I’m not sure. 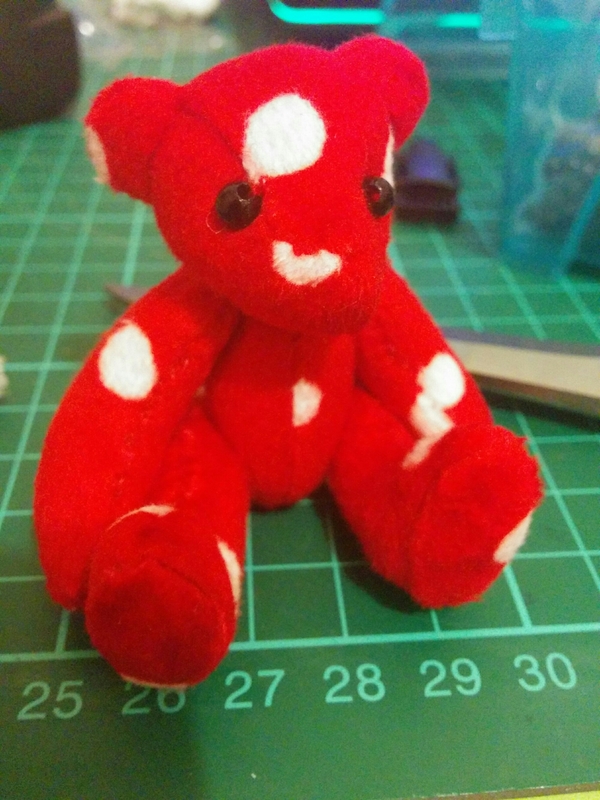 I got a bit sick of hand stitching half way through, as it was getting painful, so one I had finished that, I put him to the side for a bit while my hands recovered. 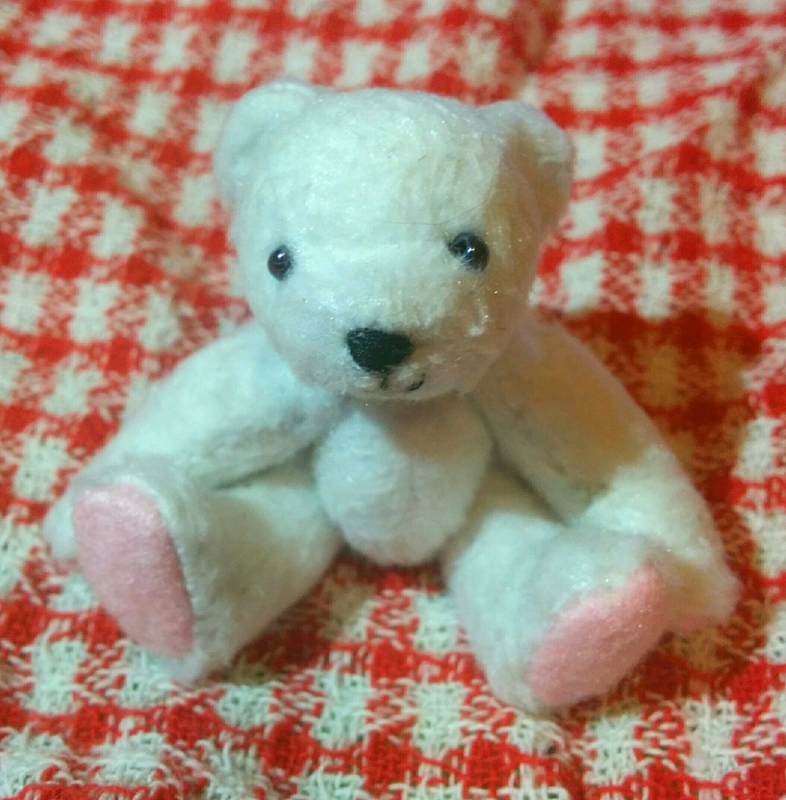 I had a dream about buying some pink fabric to make a bear, so I feel as though I need to make a pink bear, now. Unfortunately, I don’t have anything like the fabric from my dream, so I’ll have to figure that out. May take some improvising or a shopping trip. I’m madly trying to design more t-shirts to sell online. I need to start focusing on finishing designs so I can start earning something for my work. Today came with a lovely new found love of self adhering felt. I found this out, when I was making this monster from a child safe kit that my parents gave me to do while I was at their house. Unfortunately, I covered my chair and surrounding carpet in little red dots, that were half punched out to sew through. I ended up using a sharp metal needle, that I had happened to bring with me, to get through some of the holes. The kit didn’t need scissors at all, and everything except the googly eyes had adhesive on them. Which is why they aren’t in the picture. Glue, me and felt never mix well, so I’m trying to think of a good fixing technique. Perhaps a glue dot, while drying approach. As long as the glue doesn’t cover the stickiness and make it slippery. Ooooh! Hot glue would work. I’ve been meaning to get that out for embellishment making. I received a few different kits and arty things today. In the mail, came my fake nails that I bought. They’re cheap horrible ones, but I only got them to play with, as I can’t do anything interesting on my own nails, as I have no control. Even with my right hand, it’s at a weird angle. Also, my fingernails are short otherwise they dig into my palm while drawing, so I sacrificed having nice nails for art, but it’s much less of a hassle. I should have enough cupcakes to paint and foldable pictures to keep me busy for a few days at least. Just recently, I’ve found myself napping less, and having a lot more time. This means more creating time, but I haven’t learned how to pace myself yet. 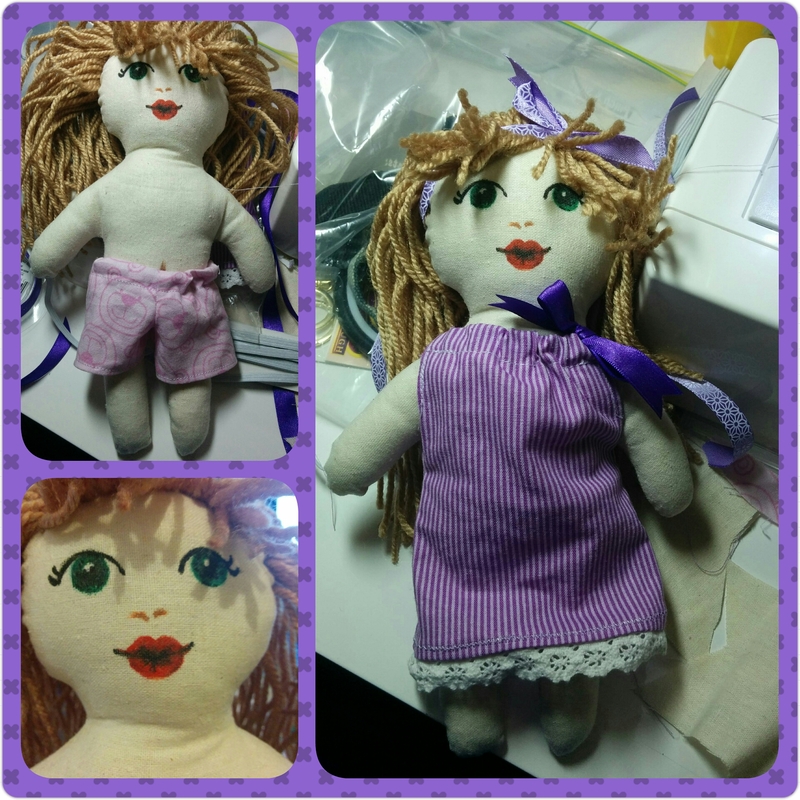 This morning, I made a doll and an outfit, including underwear, before lunch. The rest of the day was split between sewing a pincushion, a felt heart patch, watercolour and fashion design. I’ve found that I need to have a project in mind, otherwise I flounder the day away, staring at YouTube or the clock until my partner gets home. On days I am crafting, I do these anyway, but it doesn’t feel as long of a day, and I look like I’ve accomplished things. I used to make these dolls all the time with my Mum and Grandma when I was little, where you basically stitch a gingerbread shape on two layers of calico, or other material, snip around, turn and stuff, paint a face. Add a lot of hair, then design and create clothing. This was useful in learning how to draft patterns at an early age. 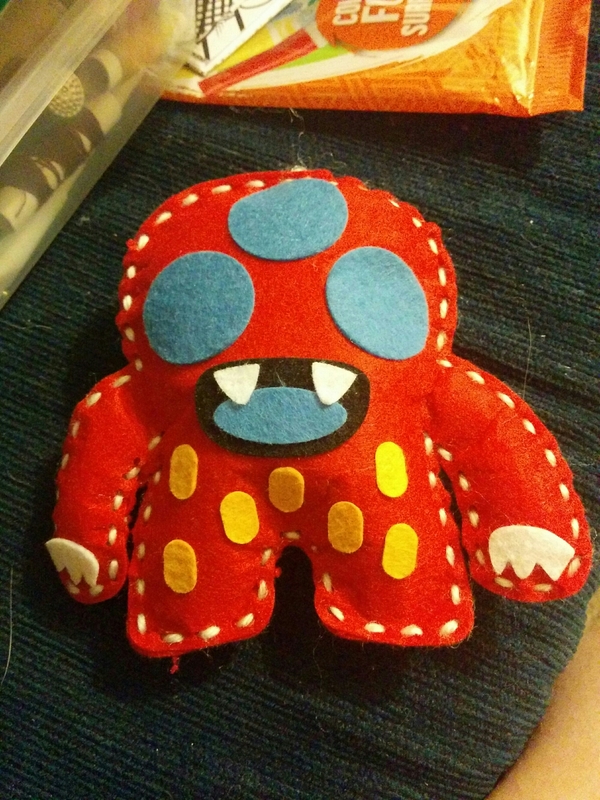 Occasionally, I will make a doll that I haven’t made in a while to compare how much better my sewing is from then. There was a couple of places that I clipped too close, and had to stitch up, and my tension was a bit off at the start, but it evened out after a bit for some unknown reason. Perhaps I need to clean my machine. I haven’t died, I’m just in the middle of a bunch of half finished projects and melting from a sudden heat wave. 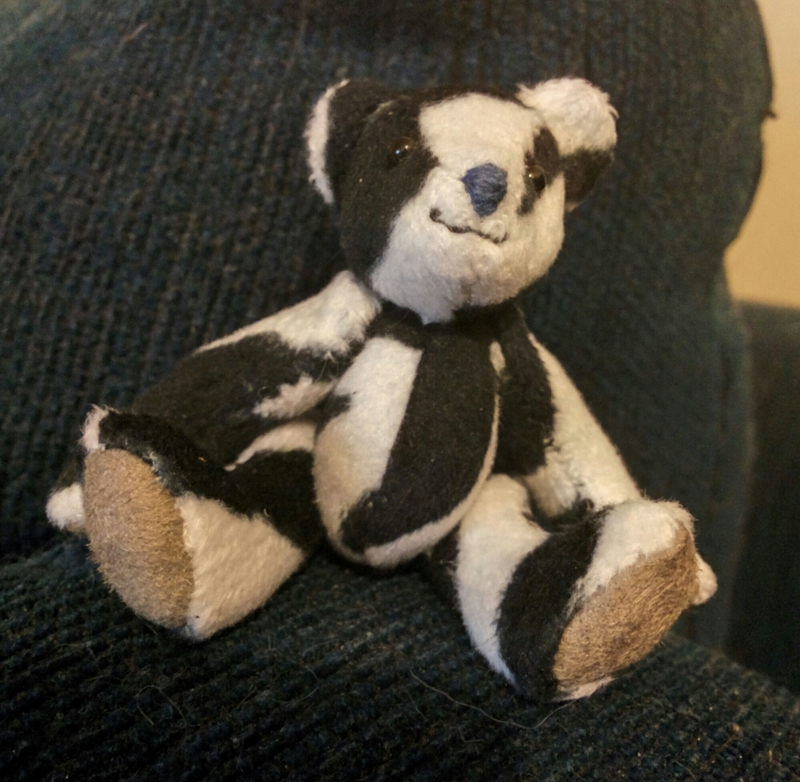 I’ve split my creative time between sewing clothes for myself, watercolour in, calligraphy and sewing this bear. I’ve been collecting some fabric, and while rummaging through the remnant basket at the craft store, I found some short pile non-stretchy knit fabric. This fabric is the most perfect for miniature bears, as it’s thick, but malleable, it looks like tiny fur, it doesn’t unravel easily and doesn’t need interfacing. I found the section that they keep it in with the baby fabrics, and there were a great range of different colours there, though mostly pastel. There was a beautiful periwinkle blue with white spots that I’d love to go back and get. 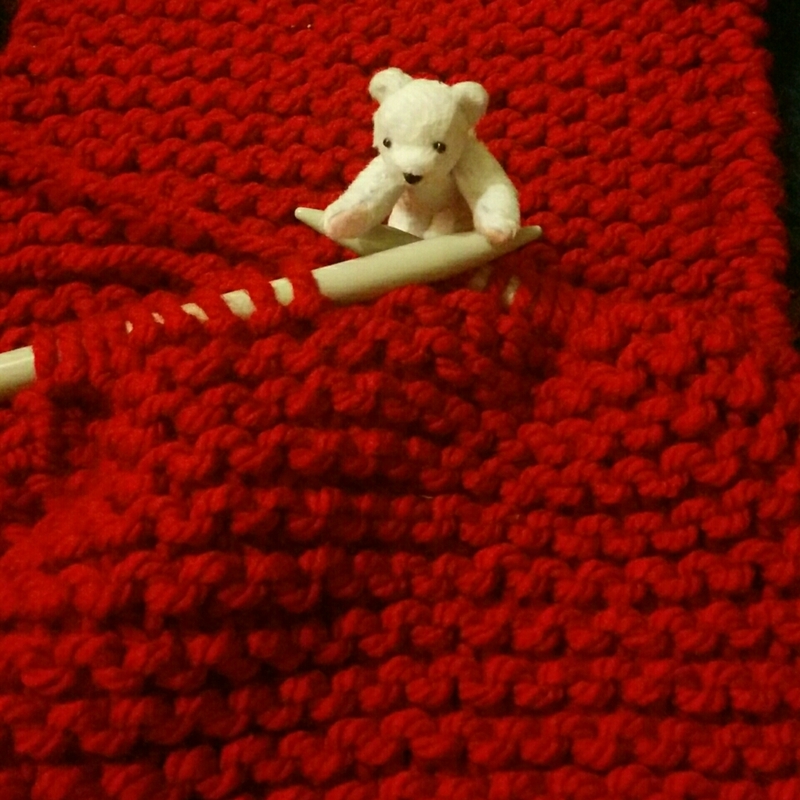 Since these bears only use up about a 20cm by 15cm piece of fabric, you don’t need to buy a whole lot of the material. I haven’t put a nose on the bear yet, and I thought she looked cute without it, but the white spot on her face looks like she has a strange white nose shape, so a nose would detract from that spot. I thought she’d look great as a little brooch to go with the navy top I’m making, but I think she’s going to run away from home and live with my Mum, next time she visits. At least I have plenty more fabric, I could make a teddy army. Another run out of money day at the city craft store. 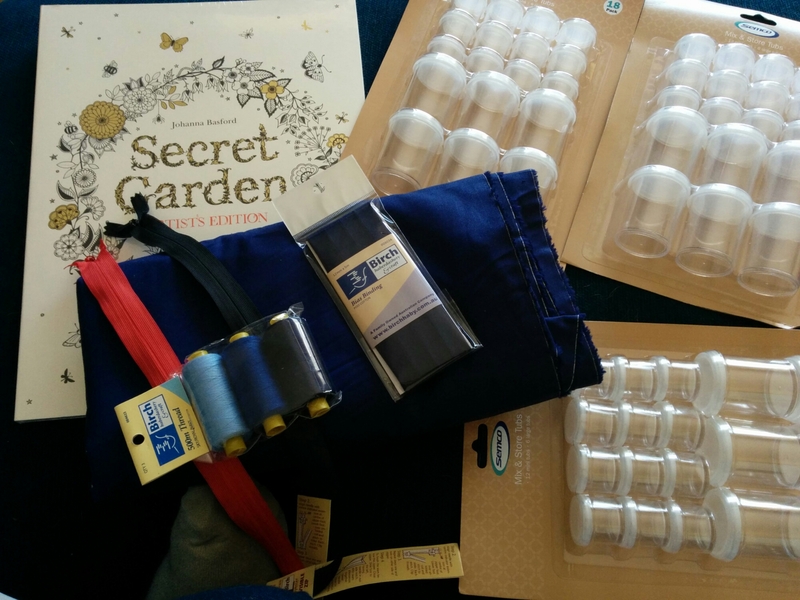 I bought some lovely red fabric to make a top the other day, but I realised that I looked at the wrong top measurements, so I decided to buy more fabric, making sure I got plenty extra. 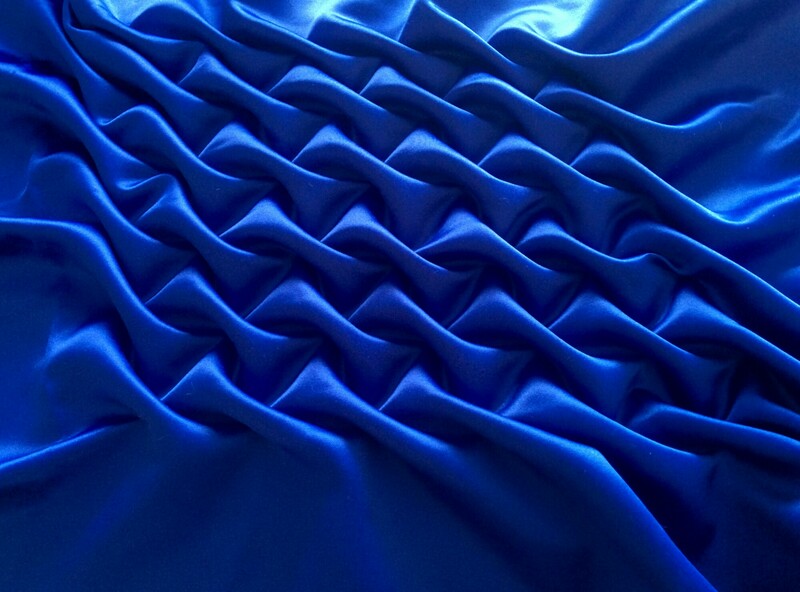 I chose a nice plain navy cotton broadcloth that could be a bit dressy. I made sure to get matching zips, thread and bias binding. 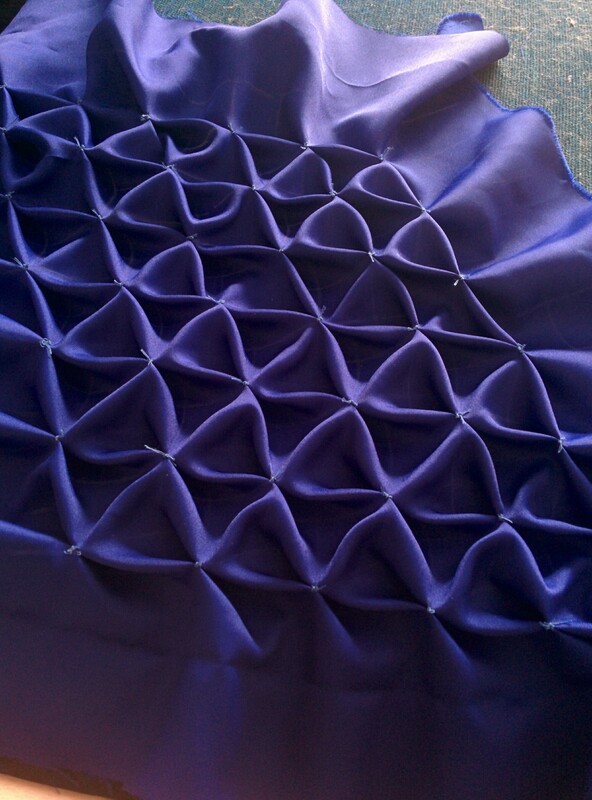 This pattern will be quite a challenge for me, which is partially why I picked simple, cheap fabrics. That way, I can practice a few times before I get some fancier fabrknock haven’t tried a pattern like this before, so I’ll have to double read the instructions. I also found an artists colouring book. It’s like the whole new adult colouring, but on gorgeous thick paper that will hold watercolour and marker ink greatly. It’s called ‘Secret Garden’ by Johanna Basford, and is filled with lovely floral designs. I love the fact that this new colouring trend is getting people into the creative, artistic groove, but I’ve always used colouring books as an exercise for my art. Using the simple child’s images and turning them into properly coloured artworks is fun. You can work on colour theory without having to draw an image first, or even modify the images if you like. The point is that you shouldn’t knock something just because it’s deemed childish. I have a box full of pompoms and making supplies, I use paper mache all the time and I have a load of colouring books. These things can be adapted to an adults level, but are intended to bring out a persons creativity. We learn by playing, which is why kids need to play. The problem is, most people stop playing when they decide they’re too old. You are never too old to learn, so you are never too old to play.